Thinking About Food: Inaugural Post!!! This is probably the daftest thing I have thought to do but I have succumbed to the idea of publicly sharing my passion for food! Since joining the forum at Nigella.com (which has since mysteriously closed!) I have also found a community of like-minded foodies who have migrated from Nigella’s site to “Violet’s Pantry”. The more I visit the more I think about food, buying it, cooking it and eating it!! Reading my fellow foodies blogs has inspired me to get off my bum and start recording my own efforts! I am a perpetual changer/adapter of recipes and my cooking style is not usually exact or purist! My idea of a good recipe is one that I want to immediately jump up and make, which I inevitably do if I have all the ingredients to hand. So, what better way to make cooking more worthwhile than to share it and maybe muse a little on the side! This being the most frenzied time of year for me as far as cooking goes it seems like as good a time as any, plus I am on my summer break from university which gives me ample time to get into the swing of things! No doubt when I resume studying it will be all I can do to open a can of Watties Tomato Soup but for now I will be making hay while the sun shines! Speaking of sunshine, we are having the most ridiculously warm patch at the moment, the last few days have been like the height of summer and have me a trifle concerned of what might be yet to come! It has put me off balance a little too as this is usually the most temperate time and when I tend to reacquaint myself with all my cookbooks. But sitting anywhere for any length of time at the moment is exasperating and the idea of turning the oven on is totally doing my head in! It seems only fitting that my first recipe should come from one of my foodie friends so tonight’s dinner was lovely and light, with inspiration taken from a recipe posted by Pistachio (thanks Pi!) on VP. Beetroot were on special at the supermarket this week and as soon as I spied them I thought of this recipe that I have been eyeing up! To accompany I smeared some lamb loin chops with the lovely Chermoula I bought at the Lyttelton farmers market while on a recent visit to Christchurch. chopped Wash beetroot, try not to damage skins. Cut away leaves, leaving 3cm stem (this stops the beetroot bleeding). Place beetroot into a saucepan and cover with cold water. Bring to the boil, reduce heat then simmer until tender about ¾ to 1 hour. When cooked, drain and cool under cold running water then slip away the skins. Slice beets and place in a shallow bowl. Sprinkle over the sugar and vinegar then season with salt, freshly milled black pepper and a tiny pinch of nutmeg. Cover and chill until ready to serve. 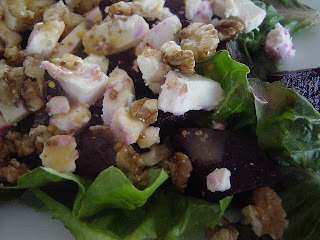 Arrange lettuce onto individual plates, then add beetroot and sliced goat’s cheese. Drizzle over the dressing then sprinkle with nuts. Serve immediately as a first course. Mix the mustard and crushed garlic in a small dish then gradually add the lemon juice, then add the oil, whisking with a fork briskly to combine. Amazingly I did actually follow this recipe exactly, who knew beetroot were so easy to prepare!!!! This is fabulous the saltiness of the feta and the sweet beetroot work together gorgeously and I will now be seeking out beetroot growers to make it again! Hi hi hi Linda, so you've caught the blogging bug too! I love the look of yours, such jewel-like colours, and with your free 'n' easy style of writing I reckon you're a natural, lol. So lots of luck, I've bookmarked you, and will be checking in again from time to time to see what you've been up to. Oh and what shall I say about you starting off with one of my recipe suggestions ... I obviously feel quite chuffed, lol. Looking forward to following your foodie adventures. Hi Linda, what a great start - love the title picture :) all the best and look forward to reading more! Thanks guys,I appreciate your kind words! 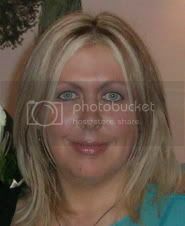 Oh what a lovely blog, well done Linda, Its really beautiful. Lovely blog, I'm sure I'll be popping in very frequently. Looking great Linda. I'll definately be popping by to catch up on your adventures. Well done!! Congrats on your new blog, Linda! It looks terrific! I know you'll have fun with it. Mmmm, nice to pick one of Pi's recipes. She's a fab cook!